In-lieu of flowers memorial donations may be made to High Hopes and left at Bland-Hackleman Funeral Home. John Lewis Eslinger, age 89, of El Dorado Springs, MO, departed this life at 2:40 p.m., on September 12, 2014, at Cedar County Memorial Hospital. He was born October 26, 1924, to Thomas L. and Eunice Ellen (Hartline) Eslinger who both preceded him in death. He lived his entire life east of El Dorado Springs, and was a retired farmer and stock man, being the fifth generation of his family living in Cedar County, Missouri. 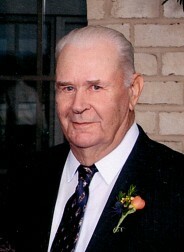 He attended grade school at Vandenburg School District and graduated from El Dorado Springs High School in 1942. Due to his stature, he was often depicted as Uncle Sam or Abraham Lincoln in school and community events. He won many local and state music contests with his bass voice, singing in duets and quartets throughout school and his lifetime. At the age of 14 he was saved during a revival meeting at Concord Baptist Church and was baptized by Pastor Hobart Mustain. He served as Sunday School Secretary, Adult Sunday School Teacher and Church Treasurer. He was Ordained for Life as a Deacon in October 1976. He remained true to the Baptist Faith and Doctrine until his death and has been received into Heaven for eternity. John’s childhood playmate, special classmate and best friend was his twin cousin, Mildred Faye (Belisle) Smith, until her death in July 2000. John was united in Holy Matrimony on December 22, 1945, in Osceola, Missouri, to Velma Jewell Bausch, also of El Dorado Springs, by Pastor Albert Gaston. This union was blessed with four children: Lewis Ray, Barbara Ann, Sharon Kay, and Virginia Lea. John served many years on the Agriculture Stabilization and Commodity Services and surveyed crop lands during some of that time. He was elected four terms as a member of the El Dorado Springs School Board. He was dedicated to his family, farming enterprise and livestock operation east of El Dorado Springs. Survivors include Velma, his wife of 68 years, and their children and spouses: Lewis and Cheryl Eslinger of El Dorado Springs; Barbara and Ken Fortney of El Dorado Springs; Sharon and Larry Lawler of Hallsville, Missouri; and Virginia and Dave Pennington of Kansas City, Missouri; grandchildren and families: Mark and Susan (Eslinger) Dingman of Liberal, Missouri, and their daughter Jesse Rochelle Leigh Dingman; Michael (Buddy) and Sherre (Eslinger) King of El Dorado Springs, and their children John Michael, Sarah Elisabeth, and James Thomas; Stefanie Eslinger of Eldon, Missouri; Patrick Eslinger of Springfield, Missouri; Scott and Allison Fortney of Green Bay, Wisconsin, and their daughters Brianne LaRue, Audrey Jewell, and Lauren Rose; Candace Fortney of Springfield, Missouri; David and Lucinda (Fortney) Cox of Ottawa, Kansas, and their son Xavier Thomas; Jacob Pennington of Cleveland, Ohio; and Brandon Pennington of Kansas City, Missouri. Services were held on Tuesday, September 16, 2014, at10:00 a.m. at Bland-Hackleman Funeral Home with Bro. Everett Smith and Bro. DeWayne Burdette officiating. Granddaughters and great granddaughters sang “The Old Rugged Cross” and “How Great Thou Art” during the service, and everyone sang “Amazing Grace” at the gravesite. Interment followed in the El Dorado Springs City Cemetery under the direction of Bland-Hackleman Funeral Home. Pallbearers and honorary pallbearers were: Patrick Eslinger, Mark Dingman, Buddy King, Scott Fortney, David Cox, Jacob Pennington, Brandon Pennington, John Michael King, James King, and Jeff Chambers.